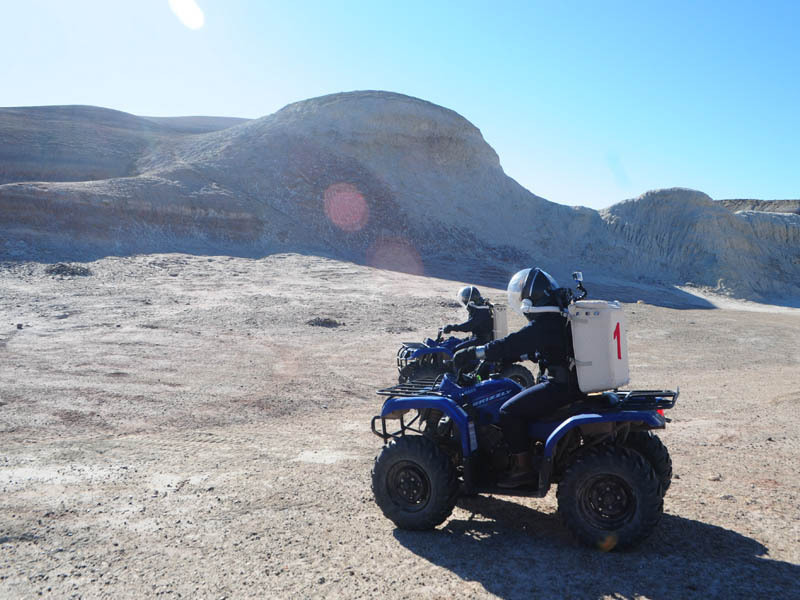 The following is the final report of Mars Desert Research Station (MDRS) Crew 160. A full review of this year's activity at the MDRS habitat will be presented at the 19th Annual International Mars Society Convention, scheduled to be held September 22-25, 2016 at the Catholic University of America in Washington, D.C. A call for papers for the 2016 convention has also been made, with details available on the Mars Society web site (www.marssociety.org). Crew 160 from Embry-Riddle Aeronautical University consisted of 6 committed students with the passion for space travel. Crew 160 spent time at school getting to know each other and held weekly meetings to prepare for the MDRS rotation. We faced some challenging and quite stressful situations in the Hab as well as our EVAs. This is to be expected and we were aware of this before our rotation began. We welcomed any anomaly and faced it with true teamwork which empowered even the greatest dilemma that the Martian planet could throw at us. We kept our heads straight and simply tackled each issue one at a time. Below are the summaries of each member that describe their experiences and accomplishments here at the MDRS as Crew 160. The experience at MDRS is truly unique and provided a beautiful representation of life on Mars. The EVAs were extremely immersive in the sense that the user inside the suit is limited in visibility and mobility which can make any simple task become an exhausting chore. Nevertheless, they were fun and allowed me to experience what an astronaut might go through during an EVA mission. The ATVs were helpful and made traveling to certain destinations much easier. Spending the majority of the day inside the small habitat showed me what it would be like to not have the simple luxury of stepping outside for fresh air as I would normally do anytime on Earth. I believe my crew accomplished a tremendous amount of tasks that will benefit each of them for their research as well as future crews of MDRS. We committed our time to further enhance the overall understanding of living on Mars and how we can help create MDRS into a more efficient habitat for future crews. My main objective was to coordinate the crew regarding tasks such as EVAs scheduling and procedures, completing and compiling reports, documenting photos and videos of missions, and maintaining contact with Mission Support. These tasks were picked up and become routine quite easily with the help and cooperation of my team. I managed to develop my leadership skills in what would be described as an isolated environment, when certain tasks had major risks associated with them. I personally enjoyed this and feel that I am capable of leading another crew again in the future. Coming to a confined area with a dark and creepy night and beautifully majestic sky during the day really puts everything into prospective. On Sol 1, everyone was excited and jumped at the opportunity to do anything and everything. On Sol 9, everyone is missing home and wants a nice full 30 minute shower. It’s been a roller coaster of team bonding and skill building out here on Mars, which makes this an experience of a life time. Throughout the rotation, my research had to be shorten a bit. I wanted to study the effects of white, pink, and brown noise have on sleeping stages of crew members. I didn’t have enough equipment to track everyone’s sleeping stages so I ended up doing a personal research with myself. In a total of six nights and switching from white, pink, and brown noise, I realized that brown noise seem to have more effect of improving my sleeping pattern, especially lengthen my deep sleep stage by an hour. Alongside this minor research, I wanted to look more into observational psychology behind each member during the rotation. I learned over time that each crew picked up social cues from each other, a six person team formed cliques in two’s, and effects of isolation on each crew member reaching peak on Sol 6. I can say that being here at MDRS has taught me a lot internally and externally. I’m excited to go back to Embry-Riddle Aeronautical University and share my research and experience to the students on campus and encourage everyone to endeavor the unknown….and Mars. So my plans for the Crew Biologist position didn’t turn out as planned. My research had to be scrapped around Sol 3 or Sol 4 when I realized the equipment was faulty. I have ended up just helping out the GreenHab Officer tremendously with the upkeep and continuation of the new GreenHab. Embry-Riddle Aeronautical University, my crew’s school, sent an aquaponics system to the GreenHab as a method to grow plants in the future. Myself, along with the GreenHab Officer, the Crew Engineer, and the Crew Commander all worked together to make sure the system is up to par and make sure it will eventually be operational. These experiences will help me to become a better GreenHab Officer when I come back to the facility next time. On the Crew Health & Safety Officer side of things my job was fairly easy all things considered. No crew members were injured or hurt physically in any way. Psychologically, the crew held together quite well. A few of the crew members have experienced typical isolation symptoms, i.e. becoming more introverted. While this was a reality faced during my time at MDRS, it will make me better prepared for the next time I come to the facility. As the GreenHab Officer of Crew 160, I could not conduct as much work as I had wanted due to the lack of facility and resources. Sewing the entrance zipper and keeping track of the temperature of the GreenHab were the only contribution I made to the GreenHab during my rotation. As a crew member, I went on multiple EVAs and explored the rough, dry terrain. As I went through missions, I realized that I became better at communicating with other crews. Describing the area in order to let the crews know where I was, asking their current status, and helping each other to climb up a hill. Those field experiences taught me about the crews and necessity of effective verbal communication. As a student, I conducted my personal research on influences of natural sunlight and going outside on emotions and stress. UV light and going outside definitely affected on my emotions and stress, but meanwhile relationships with other crews had more influences for a short rotation like two weeks. Small stuff like doing dishes or loud music sometimes irritated me and the lack of resources like water or food frustrated me. More patience and discipline are needed. As a human, as well as a student and a crew member, the rotation was very meaningful since that made me realize that I need more experiences and skills to grow up to be a genuine Mars astronaut in the future. I am definitely eager to come back again to MDRS to conduct more researches and challenge my communication and living skills to see the big landscape of Mars with my eyes. Even though my camera died on Sol 1, my crew members helped me to get photos and videos together to share to enhance my daily reports. I was able to see the progress of my crew members with not only their memories for my research, but with their personalities growing together as we lived together throughout these two weeks. I was able to help my crew members stay responsible by making sure they remembered to fill out logs for my memory research along with keeping track of their puzzle challenge progress and reminiscing of memories about our stay as we went along. I was tremendously afraid in the beginning with the hiking and the suits but as soon as the crew assured me I was going to be okay, I really was okay; I knew then that I was able to enjoy the mission as much as they all did, if not more. I could not be any more proud of myself and my crew members with all that we have accomplished and what we each now aspire for, for our futures. I can say that I am really glad to have spent the time here with these men, and Ashley, and I can honestly say we will all be amazing friends when we get back to school. There is no better feeling that could come out of this crew than fitting together and working so well with each other that we all have promised each other to stick together after we have all gone our separate ways. After being able to share such fantastic experiences with each other, how could a crew really go separate ways? I hope to come back here with a new crew from my school in the future and I cannot wait to see how everything would go together so well again. I hope I can come back to set up a study for the environment and life that will help scientists learn more about colony sites for Mars itself; or even for life of humans in the colony Hab/s on Mars as well. I am doing as much research as I can right now in the hopes of finding out what we here on Earth do not yet know. I will be sure to bring out the greatest from our current crew and from the future crew if our school has this amazing opportunity once more! Finishing out our rotation here as the engineer I had the privilege to work on many projects. From the very first day here I was faced with many challenges to overcome. On the first day, we had to figure out how to unfreeze the pipes that allow us to fill our water tank in the loft to be able to have running water in the Hab. With minimal access to the pipes, I was able to get a heat source around the frozen pipes to thaw the piping. EVAs produced several obstacles such as: having to fix a broken airline to one EVA suit, then I had to fix the charger of another suit to be able to charge, as one of the suits had a battery that was completely dead and couldn’t be charged. In the estate rooms one of the platforms was not properly secured and was ready to break, so I cut pieces of a 2x4 to secure the end that was free hanging to fix the platform. The new GreenHab’s zipper door had broken and would not stay zippered, so we replaced the zipper with another new one to keep the heat in the GreenHab to make it usable in the winter months. When we arrived there were only three working ATVs: an emergency ATV and two EVA ATVs; there were two broken EVA ATVs. One broken ATV had its parking break seized and I was able to free the parking break to bring this ATV back to operational use. The other ATV has a dead battery and the choke lever is broken but other than these two issues, this ATV runs perfectly. I was not granted permission to fix the choke on the ATV so when it gets a new battery it will be easily drivable. While out on an EVA performing an engineering check I noticed that there was a leak in the diesel fuel line that fuels the generator. Later I also found that there was a water leak coming from under the Hab. However, I was not permitted to continue to investigate and fix these issues. The water pump that supplies pressurized water to our tap water was making a weird nose like it wasn’t getting enough water; to fix this, I cleaned the filter to allow a better flow of water. I was able to map out the plumbing in the Hab and made a schematic of the plumbing system except for the waste system that is below the Hab. One of my favorite projects was being able to work on the sandstorm rover that is property of NorCal chapter of Mars Society and was in creation with NASA and Google. The rover was missing a front left linkage to stabilize the suspension. The front wheels where not connected to the servo to operate the wheels. This was easily fixed with a bolt to rejoin the servo to the wheels. After getting this sorted out, the Rover was in operational condition, however, the GPS unit still wouldn’t sync with the control station. Checking over all of the aspects I was able to get the GPS unit to reconnect and was able to get the rover back to full operational condition. Along with all of these projects, I had spent time taking panorama photographs of the Hab and different landmarks around the MDRS Hab. I spent a lot of time working with the crew to get as many photographs that I could for each member to remember their stay here at the Mars Desert Research Station. After our active two week rotation at the Mars Desert Research Station as Crew 160, I can confidently say that each member’s point of view on what life on another planet would be like has been completely reformed. The team worked flawlessly together under the pressure given by the simulated missions during EVAs and provided encouragement to grow in certain aspects of each member’s weaknesses. We challenged ourselves in every aspect. We discussed our future plans and what we aspire to become. We strived to be an effective team and became much more than that in the end. It was an amazing way to spend Earth’s New Year’s and celebrate it the Martian Way!